Measles, mumps, and rubella (also called German measles) used to be quite common in childhood. They're much less common now because we routinely vaccinate most children against them. 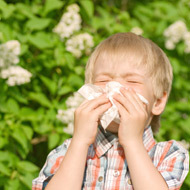 Measles causes a red rash, high temperature, runny nose, and sore eyes. It can cause acute complications, such as convulsions and diarrhoea. Very rarely, it causes permanent brain damage and death. Mumps causes swollen and painful glands in the neck, aches, pains and tiredness. It can lead to inflammation of the pancreas, which increases the risk of diabetes. It can cause meningitis and swelling in the brain; sometimes makes walking difficult and can lead to behaviour problems. In boys and men mumps can lead to inflammation of the testicles, which can (if it happens after puberty) make it difficult for them to father a child in the future. Rubella causes a rash and swollen glands. But you can often have it without having any symptoms. Rubella is most harmful to pregnant women. This is because it can cause miscarriage or serious birth defects, such as deafness and heart problems. Your baby is most likely to be affected if you catch rubella early in your pregnancy (before 11 weeks). Why does my child need the MMR vaccine? The MMR vaccine protects children from getting measles, mumps, and rubella and from getting the complications associated with them. Also, getting your child vaccinated may help to eventually get rid of these diseases. If enough people get vaccinated against a disease then there will no longer be a need for the vaccine. The MMR vaccine is given in two injections. We give the first injection when your child is between 12 and 15 months old. In the UK, we give the second injection between the ages of three and five years. Not everyone responds to the MMR vaccine the first time they have the injection. After the first dose, up to 10 in 100 children will have no protection against the diseases. But after two doses, less than 1 in 100 children will still have no protection. Your child may get some mild side effects from the vaccine, such as a high temperature. Some children become irritable, get a skin rash or swollen glands. A small number of children have convulsions (fits). Children usually recover quickly from these effects. There's no evidence that the MMR vaccine can cause long-term harm. you have any concerns about your child's vaccination programme. What about the link with autism? In 1998 a study raised questions about the MMR vaccine and autism. The researchers thought there might be a link between a child having the MMR vaccine and getting a problem with their bowels. This bowel problem might cause a new kind of autism. But, in the end, the researchers said that their study didn't prove any such link. It can be hard to prove beyond any doubt that a vaccine is safe. This is because millions of children get vaccines. And some of these children later get diseases. But this doesn't mean vaccines caused the diseases. Many other studies have looked at whether there is a link between the MMR vaccine and autism. Some have involved many thousands of children. None of them have found any evidence of a link between the MMR vaccine and autism. For example, in Japan doctors stopped using the MMR vaccine in the early 1990s. They replaced it with single vaccines. This change hasn’t had any effect on rates of autism in Japan. This suggests that MMR isn't linked to autism. Both our doctors and our paediatrician can assist with concerns about your child’s vaccination programme.